Explore a wonderful assortment of coffee and discover your favorites with the Keurig 72ct. Variety Pack. 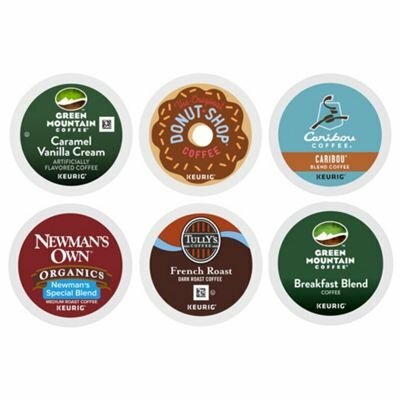 Loaded with delicious possibilities and curated for you, this collection includes 72 K-Cup pods spanning 6 different varieties from 5 of your favorite brands, including Green Mountain Coffee, The Original Donut Shop, Newman’s Own Organics, Tully’s Coffee, Caribou Coffee, and more. Sample from an impressive range of light, medium, and dark roasts, plus organic and flavored coffee too. Try something unexpected, or choose from some of our most popular varieties, like Green Mountain Coffee Breakfast Blend, The Original Donut Shop Regular, Tully’s French Roast, and Newman’s Own Organic. The K-Cup pods inside this Keurig Coffee Variety Pack are designed to work with any Keurig K-Cup coffee maker; just pop one in and enjoy delicious, fresh-brewed coffee in no time at all – with just the touch of a button. If you have any questions about this product by Variety Packs, contact us by completing and submitting the form below. If you are looking for a specif part number, please include it with your message.